JK Rowling’s old school has been put in special measures because it has some of the worst exam results in the country — in ENGLISH. Ofsted reckon some teaching at Wyedean School and Sixth Form Centre – where the Harry Potter author notched up a grade A in English – is not up to scratch. The multi-million selling author was head girl at the Forest of Dean school in 1982 and her mother Anne was a technician in the science department. But unimpressed inspectors put the school into special measures after last year’s English exams put kids in the bottom three per cent in the country. 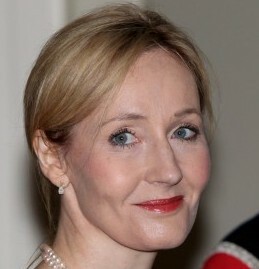 The author got inspiration for some of her iconic Hogwarts characters from the school which was once highly regarded. She left with three A levels in English, French and German before heading to Exeter University and penning the Harry Potter books which have sold more than 450 million copies and been translated into 67 languages. But inspectors say the quality of some teaching at the school – which named its library after its most famous past pupil – is now weak. “Achievement is particularly low in English and the 2012 GCSE results in this subject placed the school in the bottom 3 per cent of schools nationally,” the report said. Headteacher Mr Clive Pemberton blamed falling exam results.